We have traditionally devoted this website's contents to the discussion of J.R.R.Tolkien and his writings, and those academics that surround these subjects. It is fully our intent to continue to do so in the future. There are, however, events that arise that precipitate a worthy exception or two. Such is the case with this week's announcement that Peter Jackson will head to effort to make Tolkien's beloved The Hobbit into two major motion picture designed as prequels to his wildly successful LOTR trilogy. Many of us came to know Tolkien through Jackson's film trilogy, and it is certainly safe to say that many, many of us experienced a rebirth of our own love of all things Tolkien with the arrival of these films. Though they are understandably imperfect in the reflection of Tolkien's Middle-earth tales as they are written, is goes without saying that the films are a landmark achievement and that, at their core, there is an obvious effort to remain true to Tolkien's original intent. There is now a feeling of excitement and anticipation about the upcoming filming of The Hobbit and if that inspires us to more in depth conversations surrounding Tolkien and his body of work...then that should be celebrated as a good thing. This was bound to start happening. We cast the story's biggest roles, and wonder if Gerard Butler and David Bowie can also be lured to the set. With the recent news that Peter Jackson is finally returning to Middle-earth, it's not just fans of "The Hobbit" who are rejoicing. Just ask Ian McKellen or Andy Serkis. As Gandalf the Grey and Gollum, respectively, these two Tolkien titans are all but certain to return. But what of the other characters up for grabs in "The Hobbit"? We took a look at some of the bigger roles available and picked our favorites. Following Jackson's casting decisions for "Lord of the Rings," we considered names that were known, but not necessarily big stars. Check out our choices below and then head over to the MTV movies blog where we tackle the big one. Spoiler alert! Major plot points of the novel are revealed below. Book Says: The greatest dragon of his time, Smaug the Magnificent guarded over the stolen treasure of the Lonely Mountain. He is nearly invincible due to a belly covered in gems, and his numerous strengths include his immense size and barbed tail. He also possesses a penetrating gaze with the power to mesmerize. Haughty and hateful, he has but two weaknesses: his arrogance and a small, bare spot on his underbelly. We Say: Smaug will clearly be a CG creation, either through motion capture or pure animation. But while his appearance will no doubt be spectacular, it's his voice that should impress the most — conveying his intelligence, his greed, his great disdain for Bilbo, his love of possessing wealth purely for the purpose of possessing wealth. He thinks himself better and more worthy than any other creature, making his conversations with Bilbo a terrifying game of cat and mouse. He should be played by Jeremy Irons. Alternates: Nobody does the sort of haughty disdain we're looking for better than Irons ... but as Lucius Malfoy in "Harry Potter," Jason Isaacs comes pretty close. We'd like to see him out of the blond wig and into the red belly of the beast. Book Says: It is dwarf leader Thorin's great desire for his birthright that sets the action of "The Hobbit" in motion. Although old by the time the novel begins (even for a dwarf), Thorin is nevertheless a capable and cunning leader. Quick to anger, his great weakness is a fierce and legendary stubbornness. He refuses until the very last moment before his death to see the error of his ways. We Say: Anybody willing to go through the makeup to become a dwarf is already a hero in our book. But while Jackson ultimately has to cast 13 of them, they all flow naturally from the decision he makes with Thorin, on whose moral authority rests, not just the honor of his fellows, but the integrity of the story itself. The role will not suffer the indignity of anything less than strength personified. The actor cast, then, should be someone who doesn't suffer indignities at all. Period. That actor should be Brian Cox. He's of the right age, physical proportion and temperament. Alternates: If physical qualities weren't an issue (which is a kind way of saying, "If we weren't looking for a stocky actor"), Ben Kingsley would make an ideal Thorin for all the same reasons as Cox. Book Says: A skilled archer from the town of Dale, Bard fires the arrow that fells the mighty Smaug. Described as somewhat grim of face, Bard is nevertheless a fair and wise man, who takes leadership of the town after the departure of the Master, ultimately becoming the king of Dale. He is the closest we get in the story to "LOTR" characters like Aragorn or Faramir, an Anglo-Saxon hero in the mold of Beowulf. We Say: The role of Bard is the easiest and most tempting way to shoehorn a huge star — a man's man like Russell Crowe or Christian Bale — into the production. Although he's more of a straightforward good guy, lacking the nuance of representative men from "LOTR," we'd nevertheless like to see Jackson cast an actor who could invest the character with the same type of soul that Viggo Mortensen and Sean Bean did with Aragorn and Boromir. We'd like to see Jackson mend fences with Ryan Gosling, who left the director's adaptation of "The Lovely Bones." Alternates: We said we wanted to resist the temptation to cast a big star. Is it too late for Gerard Butler? Book Says: King of the Silvans, Thranduil leads the Elves of Mirkwood. He imprisons the dwarves when they trespass through his forest, and then demands a share of Smaug's bounty once the dragon is defeated. He is described as having blond hair ... just like his son Legolas. We Say: If Orlando Bloom doesn't come back for at least a background cameo, we give up. Naturally distrustful of dwarves, Thranduil can be spiteful and terse — but he still possesses the wisdom of his kin. Ideally, the actor cast would be somewhat regal, someone we believe capable of great power but also great benevolence. Ideally, that actor would be somewhat similar in speech and appearance to Orlando Bloom. Ideally, that actor would be David Bowie. Alternates: Orlando Bloom's old man? Yeah, Stellan Skarsgård has done that pretty well before. Book Says: Of immense size and strength, Beorn is a shapeshifter, able to take on the form of a large bear. He has a thick black beard, large shoulders and brown hair. A skilled and dedicated woodsman, he is most highly regarded for his animal husbandry. He keeps many intelligent creatures, of which he is fiercely protective. Fearsome and fearless. We Say: If he wasn't already known for similar work as Hagrid in the "Harry Potter" series, Robbie Coltrane would be a boffo choice. And yet, Beorn is so much more explosive, so much more kinetic than Hagrid, that he demands someone much more menacing. He demands someone possibly a little unhinged, who can go from gentle to ferocious at the drop of a hat. He demands Alfred Molina. Alternates: The predominant rumor is that "Spider-Man" director Sam Raimi will helm "The Hobbit" franchise. If he directs — and right now it looks like he might — well, you know what that means. Given the circumstances, he has to appear somewhere on our list. Let's stick Bruce Campbell here. Casting Call: Who Should Play Bilbo Baggins In ‘The Hobbit’? 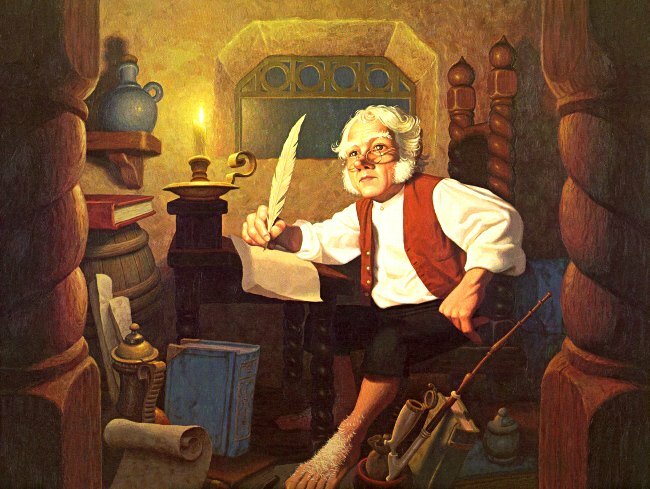 With the recent news that Peter Jackson has signed on to produce two films based on “The Hobbit,” we decided to run through our casting choices for roles up for grabs in “The Hobbit” (which you can read here), but we’ve saved the biggest choice for our blog. Read below who we think should play Bilbo, then sound off on your choices for the Ring Bearer, Smaug, Beorn, and all the characters in the world’s most eagerly anticipated film. Book Says: Hobbit of the Shire content to live a peaceful and happy life until coerced by Gandalf the Grey into joining a group of dwarves to recover their lost treasure. Brave and wise, Bilbo becomes the bearer of the One Ring and, soon after, the company’s savior on several occasions. Fifty-one years old at the time of “The Hobbit,” Bilbo was played by Ian Holm in Jackson’s “Lord of the Rings” trilogy, which begins at Bilbo’s eleventy-first (111th) birthday. So would should it be? Well, for starters it needs to be someone who could conceivably pass as a younger version of the same character, someone who at least looks and sounds like Holm. Bilbo spends much of “The Hobbit” playing in over his head, confused by the circumstances that brought him to where he is, but cocky and excited enough to, say, talk to a dragon, for instance. The actor who plays Bilbo should be good at exhibiting inner intelligence, but even better at masking that intelligence under a veil of foolishness. Months ago, internet rumors pegged Martin Freeman for the part. Sometimes the internet has it right. We like MARTIN FREEMAN. Alternates: Anything’s possible in this day and age, with computer technology a veritable fountain of youth for some actors (Look no further than the opening shots of “X-Men: The Last Stand” for proof.) If there’s a will and a way, of course we’d love to see IAN HOLM reprise his role. Sigh: I know hardly any of these actors. But I read that Mr. Bloom is not interested in playing elves or pirates ever again. I do think David Bowie would be fun! This writer forgets that Elrond makes an appearance as well. Perhaps Denethor and Theoden? I think that they are being careful to say that the extra material will come from the Appendices of LOTR because The Hobbit and LOTR are all that they have the film rights to. Pulling material only contained in The Sil or Unfinished Tales will be pretty dicey with the Tolkien Estate looking over their shoulders. Good point. I'd forgotten that stuff is unavailable - unless they do some negotiation of course. I wonder what the Tolkien Estate would say? By the time the films actually start filming all the actors of the crossover characters they could reasonably include will be quite a bit older - Hugo Weaving, Viggo (please, please, please...), Cate Blanchet to name a few. Even if they say yes they could be struggling to make the films look like a seamless precurser to LotR. Even Ian McKellen will look different. But I don't want to see anyone else in these roles either, when it comes down to it! I don't blame Orlando Bloom for wanting to move on. There is no real reason to include Legolas other than the fact that we love the character and he just might have been around and I can see why he wants to test himself as an actor and stick to more challenging stuff. He's still struggling to break away from these two massive franchises, whereas all the others have established pre-LotR careers. It's only logical that Ian, Viggo, other Ian, Sean, etc are cast as the characters of the LoTR. I actually get butterflies in my tummy every time that I think that Peter Jackson could change these characters. But, on behalf of all the LoTR fans out there, Peter Jackson should bribe the characters to make another appearance if theyre disinterested. We would LOVE to see them again. I disagree, besides the actors which I have mentioned above, to have well known actors in the movie. I think that having actors like Russel Crowe and/or Christian Bale (who are both unbelievably gorgeous!) cast in various roles will take some of the emphasis away from the movies. People will come to watch them, not the brilliant story of the Hobbit. The emphasis, as I said before, should be: The Hobbit, by JRR Tolkien, not The hobbit, starring Christian Bale. In the same breath, I do think that having well known actors would increase the crouds to the movie, and hopefully, the books as well, but I really dont think that the emphasis would be on the right place if the latter were to happen. I also disagree with Hagrid (Harry Potter) playing Beorn, unless a COMPLETE makeover is done. Beorn is a strong, powerful character that excites and scares me at the same time. Im sorry, but I dont feel any of the above with a person who played a character in Harry Potter. Ps: I don't mean to insult anyone. This post is not an attack, it's just my opinion. I gave hope to men, I have kept no hope for myself. I want Eric Bana to be Beorn! Beyond speculation regarding casting, I'm really curious about the CONTENT for the second film, which I understand is intended to span the time period between the end of The Hobbit and the beginning of LOTR. My speculation is that the second film will be more or less Aragorn's coming of age story. He was about 10 when Bilbo and the dwarves came through Rivendell. I think the second film will follow the young Aragorn as he trains with the sons of Elrond and the Rangers, meets and falls in love with Arwen, undertakes his errantry as Thorongil with Thengel of Rohan (Theoden would be just a boy) and Ecthelion of Gondor (where we should see a younger Denethor and the beginning of that fateful rivalry and perhaps the very young Boromir), his defeat of the Corsairs and the firing of their great harbor, his sojourn into Mordor, his time in Lothlorien where he and Arwen become engaged on Cerin Amroth, returning to Eriador and undertaking the Chieftainship of the Dunedain, aiding Gandalf in his search for Gollum, capturing Gollum and taking him to Mirkwood (another chance to see Thranduil and perhaps Legolas), and taking up the Guardianship of the Shire as Strider. Perhaps the movie could end with Strider and Gandalf quietly observing the preparations for Bilbo's eleventy-first birthday, maybe catching a glimpse of Frodo, Sam, Merry and Pippin in the process. The calm before the storm. To me, this is the only really complete story that can be drawn from the Appendices that spans the time period between the end of The Hobbit and the beginning of LOTR. Aragorn's journey to manhood touches upon many of the places and people that become major fixtures in LOTR -- Rivendell, Elrond, Arwen, Rohan, Gondor, Mordor, Lothlorien, Galadriel, Gandalf, Gollum, Mirkwood. Through Aragorn and the people close to him, PJ and Co. can also touch on other events from the past that are listed in the Appendices -- the capture and torture of Celebrian and her departure for the West, the fall of Osgiliath, the Battle of the Field of Celebrant and the Oath of Eorl, etc. Then again, perhaps this is my Aragorn/Viggo fanship asserting itself. Can anyone think of another compelling through-story that can be drawn from this period of time in the Appendices? Lindariel wrote: Then again, perhaps this is my Aragorn/Viggo fanship asserting itself. Can anyone think of another compelling through-story that can be drawn from this period of time in the Appendices? Yes, I am also the ultimate Aragorn/Viggo fan, but the same thought has crossed my mind as well Lindariel. 1. PJ took some decided heat for slighting the Aragorn character (and ultimately Viggo) with his cut of ROTK where he sacrificed so much story to do homage to his CG effects at the Pelennor and Cirith Ungol, and above all in the Paths of the Dead. Would he make amends? 2. I also honestly believe that the reason that this deal finally got done was far more about the almighty dollar than creative license and love of Tolkien. There is no doubt that over time Viggo has probably (together with Orlando) become the most bankable commodity that came out of the trilogy. More people appear to be willing to spend the money to return and see the two of them than almost any of the other Fellowship cast members, although each has their own unique and rabid following. Viggo's star is shining very brightly these days with the fast approaching awards season upon us (strike or no strike). I would think the money changers would be eager to seduce him into ressurecting his role as Aragorn. 3. I think it will evolve into one of two scenarios. A) Aragorn makes only a VERY brief cameo appearance in homage to the character. B) They spend some time and really delve into the story of Thorongil and the grand trist at Lothlorien. I think that PJ will sacrifice detail regarding Viggo. Please PJ let me be wrong. PS: good choice about Eric Bana, Merry. mentioned above? I'd love to have a copy of the text. Lyanness, they are at the very end of LOTR/ROTK. It depends what copy you have, of course. Some editions like my oldest and most treasured one only have the Tale of Aragorn and Arwen. For a long time I didn't even know there was any more . I think our hope for more Aragorn rests with the second film which takes the story beyond The Hobbit and bridges (I'm supposing) the gap between that and LotR. I can't see that film existing without a lot of Aragorn and Gandalf in it. I haven't got that far in my reading yet. Still busy with the Hobbit, Sil and another non-tolkien book. Touched on LoTR, but decided to read that alone and give it the attention that it deserves. What a treat is waiting for you Lyanness . If only I could read it again as though I had never read it!